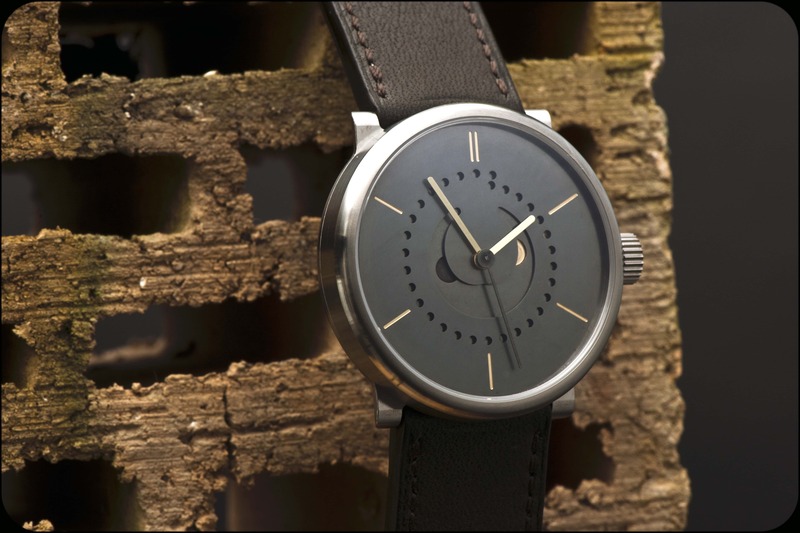 This is the ochs und junior selene patina – without any coloring on the dial! The two materials you can see (apart from the leather strap) are titanium and brass. Once Ludwig Oechslin has finished conceptualizing his latest watch innovation in his head, he makes a few prelininary prototypes. Functionality, readability and contrast are important to him. Because he makes all his prototypes watches himself, he developed a process to enhance the look of their brass dials: he patinates them with a restoration product, after which he mills the indices for maximum contrast. We decided to offer this process as an option – it involves no use of paint. In the production watches, Peter Cantieni machines the dials at his workshop in Hinwil, hand-patinates them, then mills the indices (you’ll notice that this particular watch has double baton indices at 12 o’clock instead of the big dot representing the sun). The date disk at the back of the perforations is also fashioned from patinated brass, with the date dot milled to reveal the brass. The moon phase disk bearing the two moon images is – you guessed it – also patinated brass: the new moon has been milled, then repatinated to make it darker, while the full moon remains milled so you see the brass. The seconds hand has also been patinated so as not to stand out from the dial – this focuses the attention on the other two hands, which are also brass, but hand-satinated for perfect legibility. The selene comes in a titanium or silver case (42 mm or 39 mm).